Lineup for Literacy - Ready to go! 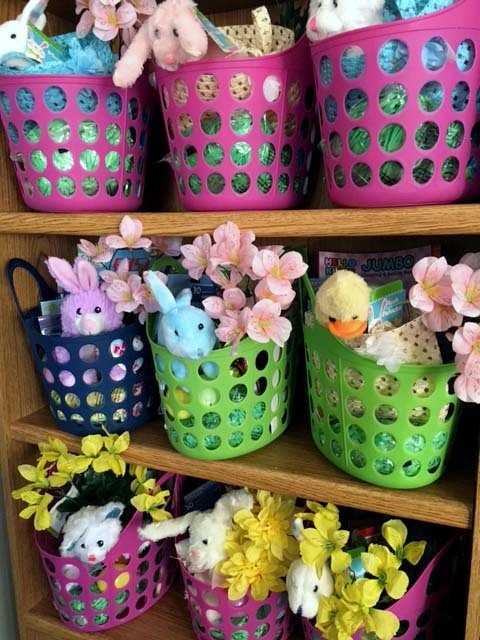 Pretty baskets of plush bunnies and Spring blossoms hiding behind them – in a nest of colorful paper grass – a treasure trove of early literacy-related supplies including: books, coloring books, first words, numbers, and shapes flash cards, crayons, pencils, colored pencils, construction paper, notepads, new magazines and more. These fun heralds of Spring, Easter and reading readiness are for our Freadom® Family Participants – families with young children ages birth to three. At Chicago’s Family Focus Englewood – a premier family support organization with whom we are in a collaborative partnership. From Thursday, March 28, 2019, to Easter. Selling the “sizzle” of books, reading and writing (scribbling!) in the child’s earliest years, involving the whole family, and partnering with other family support organizations prepare the child for success in school and in life, thus helping to break the cycle of intergenerational incarceration for children at risk. A big Thank You goes to The KIWANIS CLUB of LAKE VIEW Chicago whose generosity made this distribution of over 200 individual items in the baskets possible.